F1 bosses are meeting this weekend in Bahrain amid concerns that the new engines and limits on fuel use are causing viewers to turn off. Alonso said F1 needed to put on a "better show" but pointed out that the new season was only two races old. "There will be some exciting races and some boring ones," he added. The 32-year-old double champion drew an analogy with football. "Some matches you watch a 0-0 and it's a terrible match and then the next week you see 5-4 and enjoy the game so much," he said. "We are all waiting for this exciting race that everyone hopefully enjoys and we see this weekend if we can put something better." New F1 rules this season have introduced turbo hybrid engines and fuel restrictions. Ferrari president Luca Di Montezemolo met F1 boss Bernie Ecclestone in London on Thursday and is flying to Bahrain for Sunday's race, where the two men plan to talk with Jean Todt, president of governing body the FIA. Ferrari were behind moves to make F1 engine development directly relevant to the way road cars are being developed. The rule changes ensured Renault stayed in the sport after the French company said it needed F1 to have a greater relevance to road cars to justify the expense. Honda are also returning to F1 next season. But Di Montezemolo has already expressed concerns about the changes, worried it might produce "taxi-cab driving". He is also concerned that the fuel-flow rate is too complicated a concept for audiences to follow. It has already caused controversy following the disqualification of Red Bull's Daniel Ricciardo from the season-opening Australian Grand Prix for exceeding the fuel-flow limit. Red Bull's appeal against that decision will be heard on 14 April. There is little prospect of rules changing this season, as that would require unanimity among the teams. The Mercedes-powered outfits, whose engine has a clear advantage over those of Ferrari and Renault, would reject any attempt to alter the terms of competition. 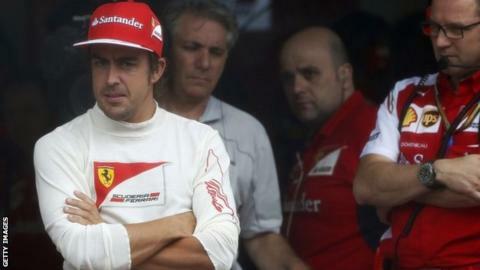 Alonso added that it was unlikely a change in the rules would make any difference to a team's competitiveness. "If they allowed some more fuel in the cars that are fast, they will be even faster, the cars that are slow will be a little bit less slow," he said. "It's not that we will see the Marussia or the Caterham, with all respect, winning the race." Talks between three of F1's most important power-brokers will not focus solely on the details of the new rules. They want to stay open to all ideas in an attempt to ensure F1 sustains its appeal. A senior insider said there was a "sense of urgency to identify what can be done to improve the show". Ecclestone has already been critical of the sound of the new engines, which are much quieter than their predecessors.